Working with FR muslins can be tricky and very frustrating, but knowing your battles before you begin can save you hours of frustrations and ugly scenery. 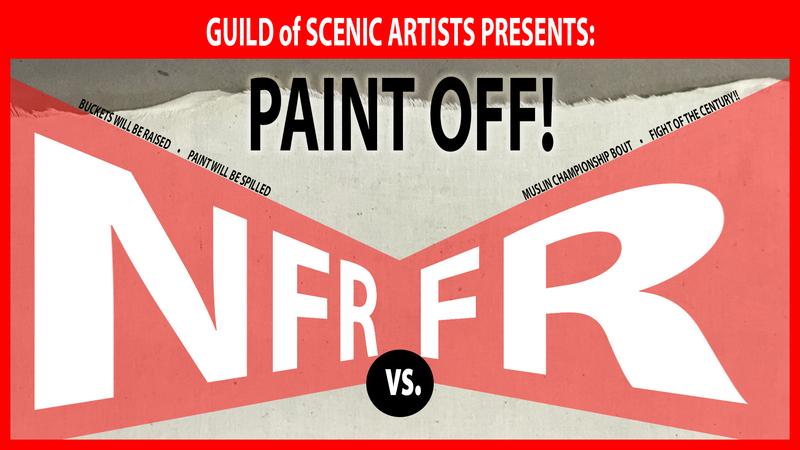 A common question we see pop up from Scenics is ‘What is the difference between painting on NFR and FR muslin, and why would you choose one over the other?’ That question is often answered with a resounding chorus of veteran Scenics yelling “DON’T USE FR!”. Flame Retarded (FR) muslin has a long history of being cranky to work with and harder to paint, and thus many Scenics would rather paint on Non-Flame Retarded (NFR) muslin and take the time, in the end, to properly apply a flame retardant. There are times, however, where the decision as to what to paint on is taken out of our hands, and knowing how to work with FR muslin can save you a lot of headaches while still creating a pretty product. 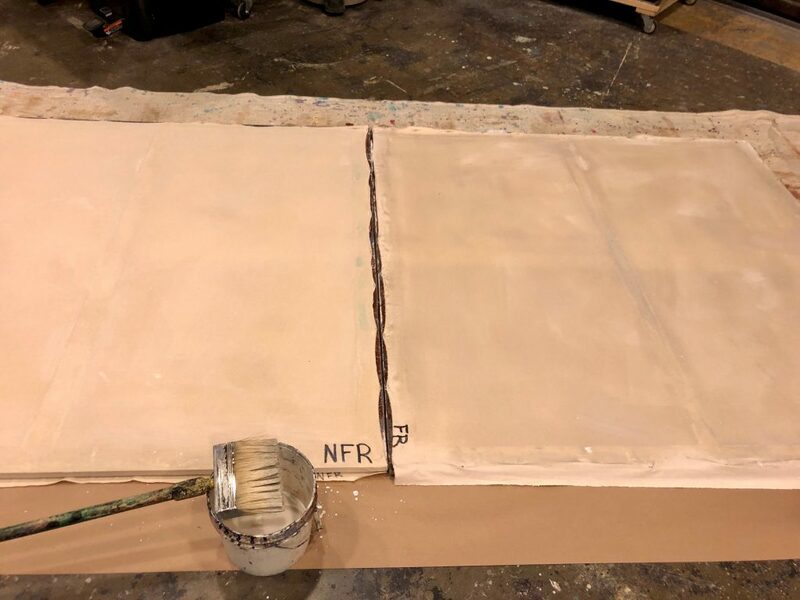 So, with assistance from two of the Guild’s sponsors – Rosco and Gerriets – and a lonely day at my shop watching paint dry for my other job, I decided to get my “Scenic Science” on and compare the two types of muslin with a nice side-by-side Paint-Off. I started with two sample-sized pieces of Gerriets Super Muslin in the natural color – one NFR and one FR. On visual inspection, they both appeared to look the same, with the FR being just a shade lighter, brighter and a tad more translucent, as seen when I put one of our Guild brochures underneath. 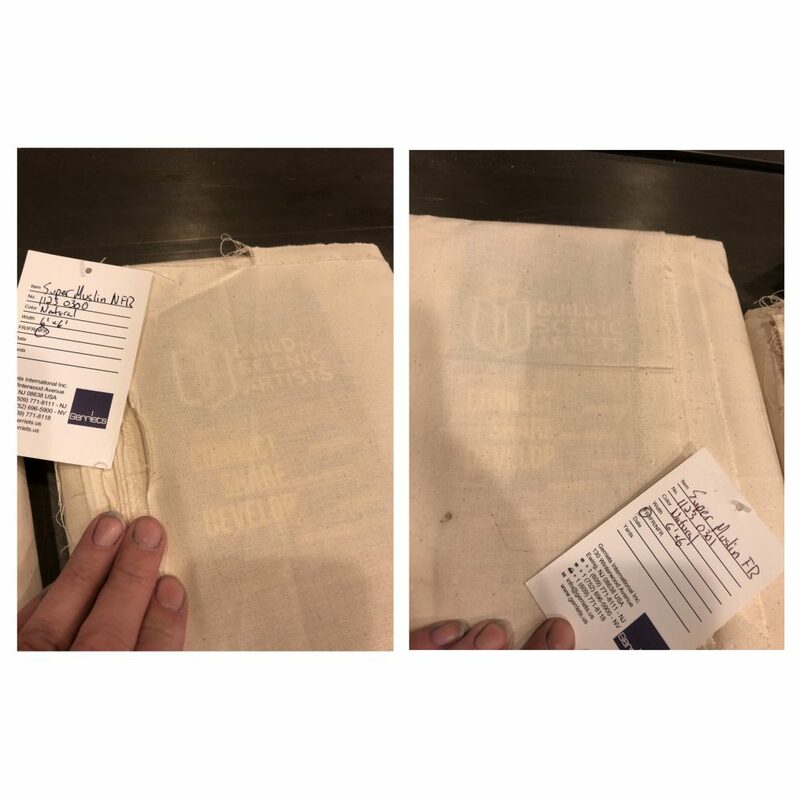 It’s when you start handling FR muslins, of any brand, that you can start to feel a difference – it feels slightly oily, or dirty, in a sweaty t-shirt type of way. 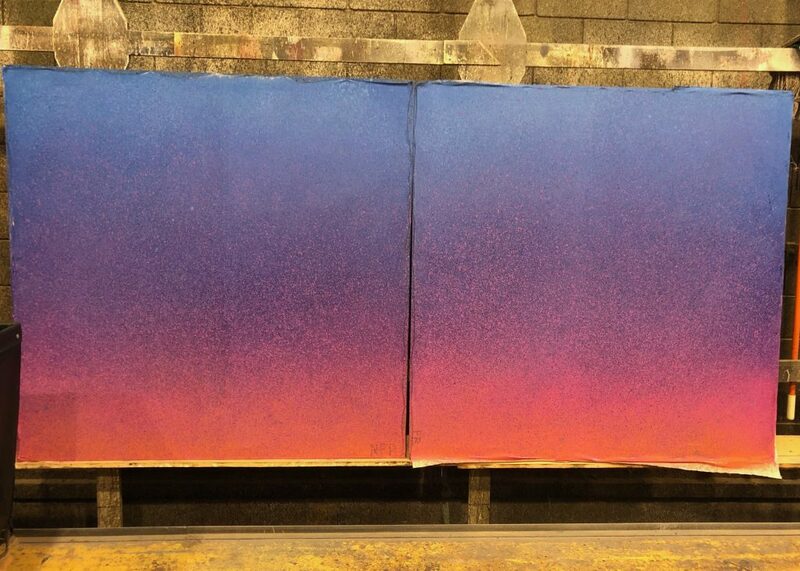 I started my Paint-Off samples by stapling my muslin to two 5’x5’ Broadway-style flat frames. That’s when the difference between the two became more apparent. The NFR muslin retained its creases and wrinkles more, even though it felt easier to stretch out. For sizing, I went the easy route and just used a thinned flex glue and clear Rosco Flat mixture, rather than cooking starch for such a small sample. I used a brush to apply the sizing and immediately felt and saw many differences between the two fabrics. The NFR behaved as expected and shrunk nicely. The FR went translucent, shrunk a moderate amount, but didn’t get as tight as the NFR. This can be seen in the size of the scallops between my staples. It’s at this point in the process that working with FR fabric will start to get tricky. Unlike NFR muslin, which always seems to keep its “shrink”, once FR dries it tends to relax a bit and become loose again; a habit that will happen throughout the entire painting process to the bitter end, and can cause confusion and delay. Speaking of drying – FR muslin takes FOREVER to dry, and can also be deceiving. It may look dry, but when you touch it, it can still have that “cold, damp” feel. I found that throughout this process that I needed to aim my fan just on the FR fabric side – and that side still took longer to dry. Why is knowing that FR fabric only “looks dry” so important? This is because any time FR fabric gets wet you run the risk of the salts that create the flame retardant deciding to leech out and crystalize. Many a Scenic have walked across a damp FR drop only to find little white footprints after it has finally dried. While I was waiting for the sizing to dry I decided to mix up the colors for my sample. I wasn’t too concerned with actually matching to anything, so I just started grabbing pretty colors off the shelf. 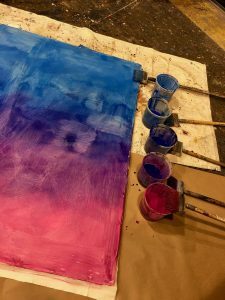 My goal was to create a very pretty large scale ombré, to see if different colors reacted differently. I started with about 1/2 cup of Rosco Off Broadway Paint in each of my two-quart buckets. Magenta, Magenta with a bit of Purple, Purple and Ultra Blue, Ultra Blue, and finally Ultra with Sky Blue. I added about a quart and a half of water to each and had five glorious buckets of rich vibrant color to play with. I wanted to keep my paint as thin as possible for two reasons. 1.) 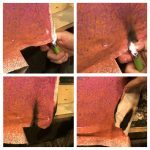 The thinner the paint the better chance I have of the FR fabric passing a flame test in the end, and 2.) the wetter you work with FR fabric the more opportunities you have to create those salting issues -it’s a Catch 22. I wanted to see if I could create problems with my sample. I started on the NFR muslin with the lightest blue color, worked my way through to the purple and finally the magenta with a nice soft wet blend technique. I wanted the colors to blend in a soft scumble style and wasn’t too concerned at this point if I had perfect blends, as I knew my next steps would resolve any blending issues. Even though my technique and paints didn’t change for the FR sample, the results couldn’t have been more different. Immediately the paint felt “slippery” on the surface and not only could you see all of my brush strokes, but the paint felt like it was sitting “on top” of the surface rather than being slightly absorbed like the NFR side. 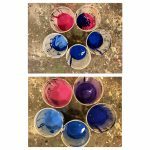 Even the colors appeared different – they were lighter, washed out, and didn’t want to blend as nicely. You can also see on the right side some “whiter patches” from where the sizing was apparently still wet even after all the dry time I gave it. It’s this washed out color effect that many Scenics do not enjoy when working with FR muslins. 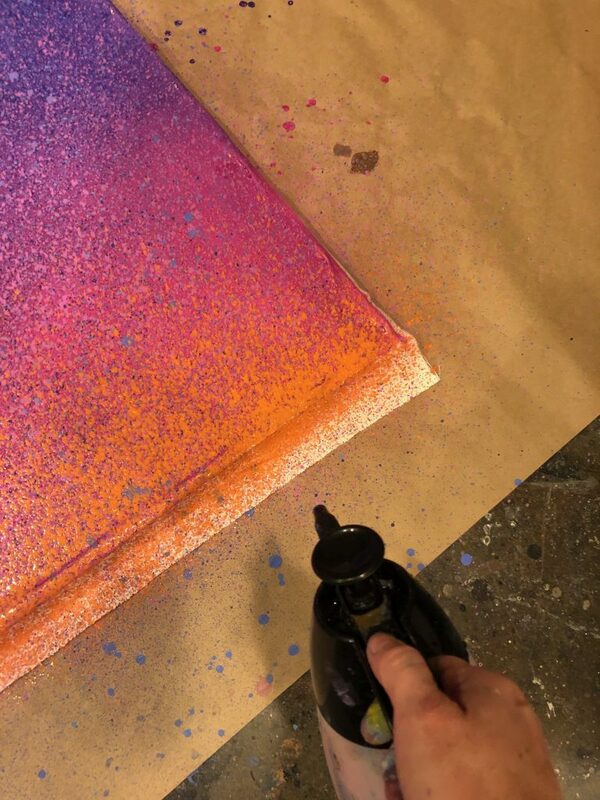 It can take multiple coats of color to finally get to the saturated color and effects you actually wanted. So that’s what I decided to do – on one side of each sample, I redid my color blends. 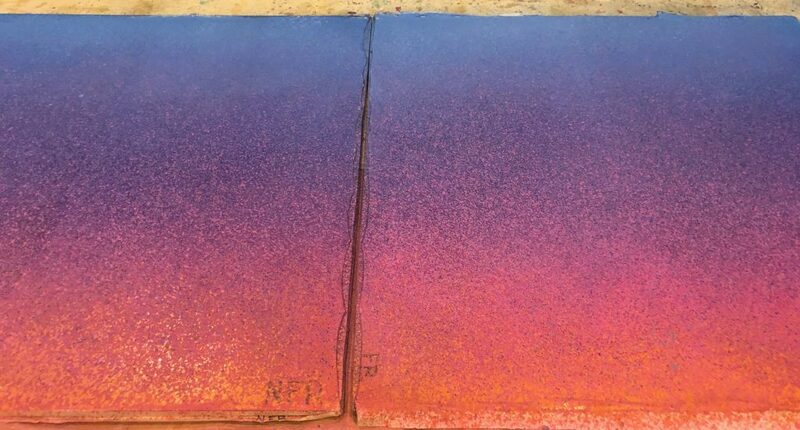 Partly to see how many coats it would take to look pretty on the FR side, and if doing that second coat on the NFR side would actually create a better blend in the end. Which is, usually, a step I skip. 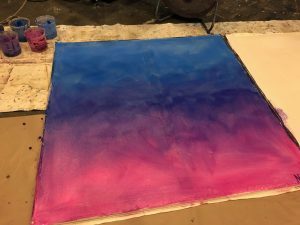 After I let this step dry I started on my favorite part of large form ombrés – the spraying!! 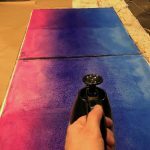 I use a cheap P-50 style sprayer and start with using my original colors that were already thin enough to spray without adding more water. I like to start with my middle colors and then work my way out from there with varying layers of overlap. The idea is that the little dots of color spray create a faster version of pointillism and your eye starts to create the blends for you. After my passes of the original colors, you can really see the vibrancy of the Off-Broadway colors really come through. I also noticed that the FR side is catching up to the NFR side much faster than I was expecting. On other projects in the past, the FR fabrics have taken me 2- 3 coats of brushed-on color to get the vibrancy I wanted, not just the layers of spray. Also, as pretty as this ombré is, I am not happy with how dark the center is, and that the overall effect is just three mushy stripes. 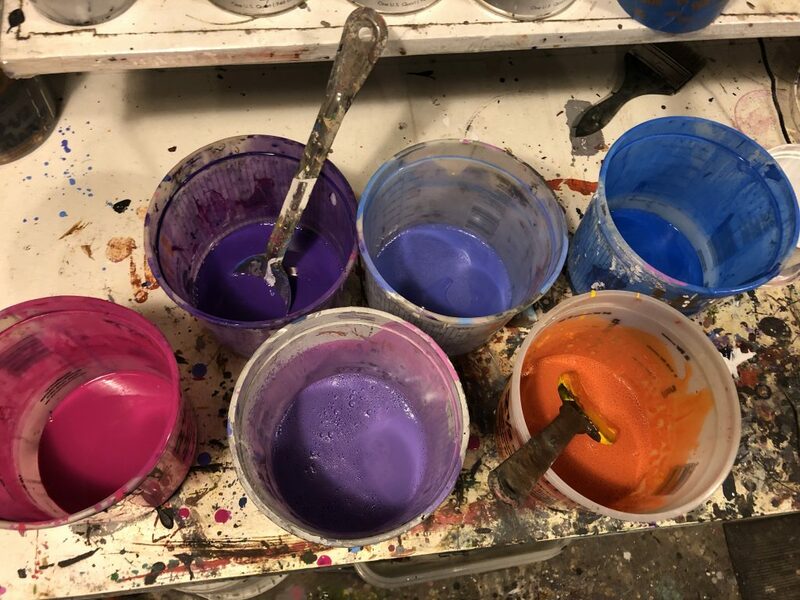 So this is when I started to tweak my original colors by creating more “mid-tone” colors to spray with and adding in white to brighten up the purple and pink. Being able to tweak colors and add in new ones to shift the blends is why the spray method is so successful and easy to do. It is also after these layers of spray, that if my samples had not been labeled, I would not have known which fabric was which. Even the sides, with a second full layer of base coat paint, were harder and harder to see a difference in, thanks again to the magic of a sprayed pointillism. At the last minute, I decided to tweak the ombré some more and added some Golden Yellow to my tinted Magenta, my favorite recipe for orange, and it helped create that perfect orange sunrise glow. In the end, when compared side by side, the differences between the two fabrics are very subtle, and any of the four options would be suitable for the stage. I have to say I was completely surprised at how well the Gerrietts Super Muslin FR fabric sample looked. I admit that I went into this science project expecting it to never match in quality of color to the NFR sample, or with as few problems. 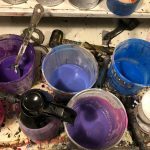 When I’ve worked with other FR muslin and canvas products from other companies in the past, it seemed to lead to frustration, grumbling, and more layers of paint. Sadly, the more layers of paint you add to any FR fabric, the less likely it will be able to pass a flame test, thus negating any cost savings of using a FR fabric. 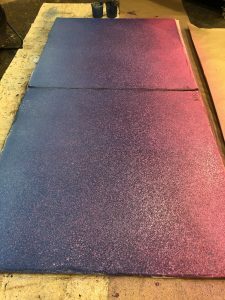 Speaking of passing a flame test, I did test the FR fabric – once on the edge, which had less paint but was more likely to catch on fire, and on another area that had both layers of the base paint and all the sprays. They both charred up, with the painted version creating more smoke, but the flames went out within a second or less after we removed the flame on both- which is exactly how a properly FR fabric should perform. Had it not passed, which is highly likely when painting on any FR fabric, I would have flipped my project over and given it a good spray of Flamex NF, and retested. Thanks again to Gerriets and Rosco for letting me play with your fabrics and paint for the first of many of our “Paint-Off” projects. 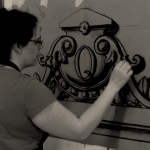 Angelique Powers has been painting for over 15 years and has an MFA in Scenic Art from Cal Arts. Along with being the Charge Artist at Penumbra Theatre she also freelances and works with the University of Minnesota as an Adjunct Lecturer. She is currently most proud of her work as a Founding Board Member of The Guild of Scenic Artists and her work here on The Scenic Route. Have you ever painted on an FR fabric and have any tips or tricks to share? We would love to see them in the comments below! If you do choose the NFR fabric, would you spray an even coat of Flamex NF over the drop at the end of the process? What a great question- yes! In the past I have flipped the drop over onto its face, restapled and then given it a nice solid spray of Flamex NF. I prefer doing it to the back verses the front for fear of creating an unwanted sheen or messing with my paint colors. Another option would be to add Flamex PA paint additive to all of your paints, but I haven’t had the most consistent results with that. I can see from the photos in the article that there may be some advantages to getting the NFR drop depending on the detail of the paint job that you have to do. But considering the slight cost difference of the muslin to begin with, I’m just wondering if the labor cost to re-stapling the drop add spraying the Flamex NF is worth the extra cost if the end result is likely going to be the same. Great work. I’ve run into the stretching issue when using FR muslin as well, and I definitely prefer to work with NFR, even if it means having to Flamex it afterward. Thank you for these insights, Angelique!